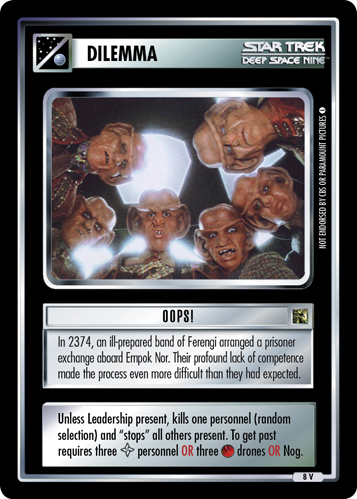 In 2374, an ill-prepared band of Ferengi arranged a prisoner exchange aboard Empok Nor. Their profound lack of competence made the process even more difficult than they had expected. Unless Leadership present, kills one personnel (random selection) and "stops" all others present. To get past requires three personnel OR three drones OR Nog.